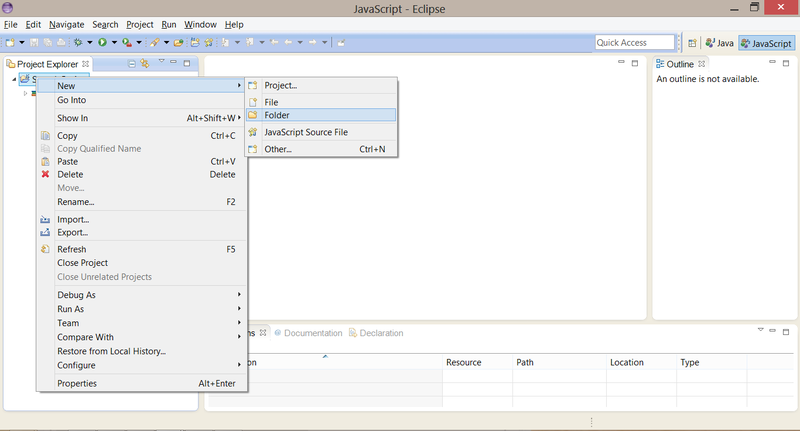 To create a script file inside the scripts folder, right click on the folder, and then click on New File. Give the new file its appropriate name and click on Finish . Let us name the file as sampleFile.js .... This is a huge oversight by the Eclipse people :) What you can do is create a project in the New Project wizard, and then specify the same name as the folder (don't think it matters though). After that, you can create files in that directory using the project. To create a script file inside the scripts folder, right click on the folder, and then click on New File. Give the new file its appropriate name and click on Finish . Let us name the file as sampleFile.js .... 7/09/2005�� There might be a plugin in eclipse to do this, but I don't know what it is. The normal way to deploy a program is to create an executable jar file. 7/09/2005�� There might be a plugin in eclipse to do this, but I don't know what it is. The normal way to deploy a program is to create an executable jar file. This is a huge oversight by the Eclipse people :) What you can do is create a project in the New Project wizard, and then specify the same name as the folder (don't think it matters though). After that, you can create files in that directory using the project.